Detroit has a bad rap. Crime, poverty, corruption, bankruptcy, insolvency … those aren’t words that usually attract people to a city. Yet I lived there for nearly a year and survived. Ok, that sounds a bit melodramatic, which it is. I wasn’t living in any ghetto. I stayed in a 100-year-old brick building called Wellesley Apts. right near Wayne State University, an institution with 25,000 students known for its engineering and medical fields. Essentially I stayed in a Chinese apartment with the odd foreigner here and there. My landlord was Chinese, and nearly all 3 floors had Chinese who were either students or employees of the university. I lived in the basement with neighbors from Sri Lanka and South Korea. It was a studio apartment that had seen better days. The toilet always seemed to have something wrong with it. The hot water was quite sporadic in the shower. And the wooden floor was sinking into the ground. On the bright side, it was cool in the summer and hot in the winter. And for $450/month, the rent was a steal. So overall, I had nothing to complain about. After moving into my apartment in January, I didn’t know what to expect from the city. Was it as bad as everyone said? Had the media’s grim castigation of Motown been a damning truth or a falsehood? I decided to find out. So I began to drive. And some places were worse than I imagined. My Korean friend and I drove down a street on the way to Grosse Pointe, and it felt like we had entered a city that had forsaken its people. Nearly all businesses along the main street were boarded up, abandoned, or burnt down. Oddly enough, there was a plethora of liquor stores and churches. Not sure how what works, but those were the two thriving institutions. All else had forsaken this place a long time ago. The houses weren’t much better there. Some were plodding along, but others were in bad disrepair. Caving roofs, cracking walls, and splitting concrete foundations. Others had been torched, leaving behind some scattered, blackened beams that towered over an ash heap. It was a sad sight to see, and I could understand how hopeless some people could feel living here. There was no future in this place. Another time I drove to the old Packard factory, which is an ignominious landmark in Detroit. Like other factories in this city, it was thriving in Detroit’s golden years but had now embraced the decay that comes from neglect and insolvency. Literally I thought someone had bombed the factory complex. In one section, a tangled mess of concrete, brick, and rebar had collapsed and left a gaping hole in the building. The windows had all been shattered, and I stared through the windowless voids into black nothingness. Motown had once been great, but it had fallen low. But not all was decay and blight. There were glimmers of light, and perhaps they would pierce the darkness. But it would take time. Eastern Market was thriving. After a five minute drive from Wayne State, I parked near this expansive farmer’s market. Farmers from the country had trucked in their goods, and you could find fresh produce, raw meat, and even homegrown honey. Prices weren’t great compared to Meijer (local supermarket), but the atmosphere had good vibes. And there were free food samples, which I always appreciate. You could sample orange slices, grapes, sausage slices, and chips and salsa. I tried them all. Later on, I found a cheese shop that had a music studio on the third floor. Today was the day to go because it was open studio day. Luis Resto, a versatile pianist who had played background music with Eminem, was there. And his African friend joined him. They started riffing off on each other, and it was a delight to listen to. I could have stayed there for a while. When spring came, I decided to bike around the city, and there were some enjoyable spots to visit. Dequindre Cut, a former railway line, had been converted into a bike path, and it led straight to the Detroit River. 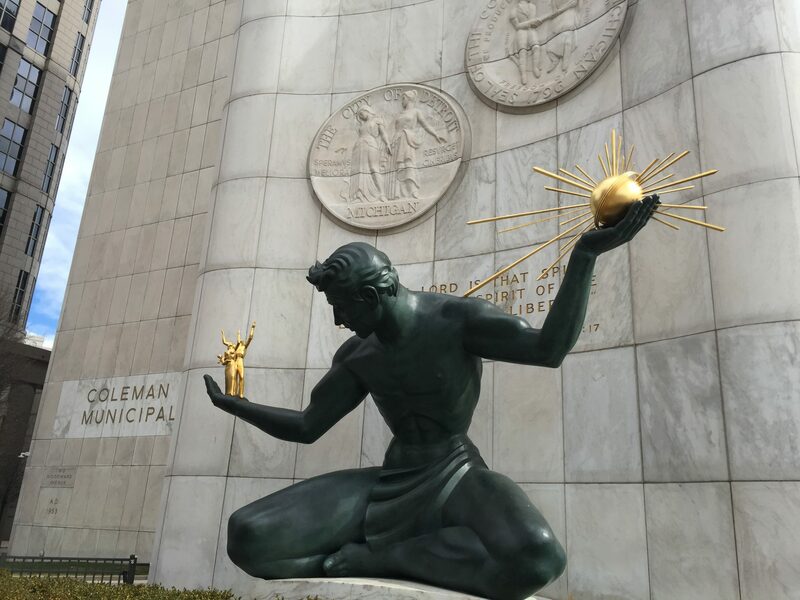 Along the route, it went under concrete bridges that were now art symbols of Detroit’s tenacity and spirit. The paintings were quite diverse. One sported African warriors in traditional garb, another depicted astronauts in the cosmos, and one had race cars zipping along a track. They gave a certain charm to the bike path and showed that Detroit’s artist community still had pride. And it showed. Downtown was coming back. Ernst Young, Compuware, and GM had set up shop here. Several times I went to Campus Martius Park that was a green plot of land surrounded by glass and concrete. In the summer, they converted one part into a green space with chairs and benches and another into a beach area with plenty of sand for the kids and a bar for the adults. During the summer, different city parks featured movie nights for us city dwellers. New Town, which was near Wayne State University, had a little park that centered on a music stage with a giant screen as big as a movie theater. I went there a few times for a free movie and free popcorn. Not a bad deal for a summer night out in the city. I certainly haven’t drive everywhere in Motown, but I have seen the good, the bad, and the ugly. And I think there is still hope for this blighted, economically depressed city. Businesses are returning, Midtown is booming, and hipsters are descending upon this city. What happens in the future is anybody’s guess. But for Detroit, I hope it’s a bright one.